Situated at Kohima, The state museum has a rare collection of artifacts of the different tribes which inhabit in the state. The museum depicts ancestral weaponry, Old Naga currencies, Attire of warriors, Dresses, Longdrums, Artifacts, Carved gatepost, Status pillars, Jewellery etc. 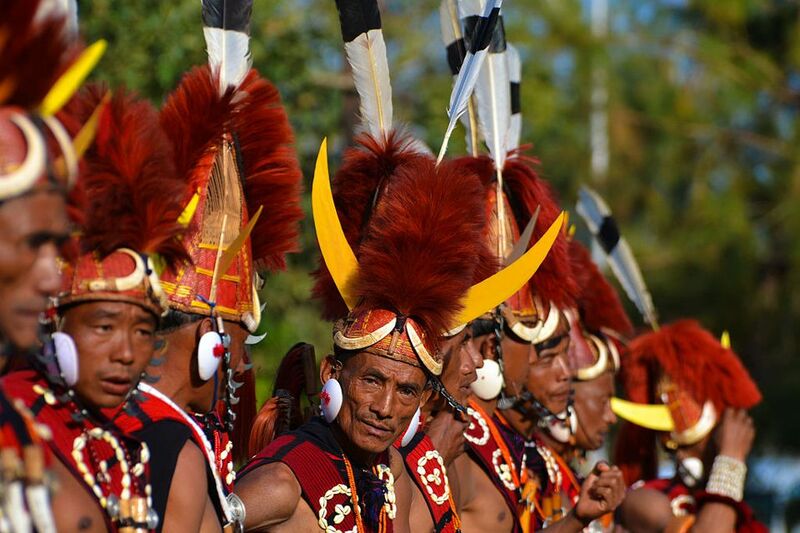 One must see for getting an idea of the customs of Naga people and traditions. This cathedral is situated at Aradura hill ( 4km from the heart of the Kohima town ). The cathedral is one of the biggest in the whole of the Northeast. It is a perfect blend of the modern and indigenous architectural styles. The ancient Kachari capital Dimapur is one of the most important sites of megalithic culture, Established before the Ahom invasion in the 13th century A.D.
On most of the ruins, there is evidence of a touch of Hindu influence, Though these are predominantly Non-Aryan, With elaborate rituals and the cult of fertility. It is located at Seithekiema village area at a distance of 16km from Dimapur. This three tier waterfall is cascading from a height of 280 feet into an inviting natural pool. This resort which is being developed by the Department of Tourism is worth visiting. Situated about 300 kms from Kohima and 30 to 40 kms from Phek, The Shilloi lake is shaped like a footprint. It lies on the slopes of the Indo-Myanmar water shed in Phek district. This lake covers an area of 0.25 to 0.30 Sq. Km. This peak is situated about 1 Km away from the heart of Pfutsero town. The glory peak is a beautiful picnic spot from where one can view “Mount Everest “, The highest mountain in the world. This peak offers a panoramic view of the whole of Pfutsero town along with its surrounding villages and towns. It is situated at the foothill at a distance of 43 Km from Dimapur. Watching the river Doyang flowing swiftly gushing through hills and valleys in a Zigzag way is really a splendid scene. It is an ideal spot for Rafting, angling, Picnics and river camping. Situated in Kohima, Is a caged zoo of the oldest menagerie type with very few open enclosure. Visitors can see the glimpse of the Fauna of Nagaland along with some rare species of animals and birds. One can also see the Bltyhes Tragopan- A rare species of pheasant found in Nagaland. Situated at an altitude of 3.3841 meters above the sea level, is the highest peak in Nagaland which is located in Kiphire district. This peak is also of the Non-Himalayan Mountains of India. It remains snow-capped throughout winter and the snow melts and flows into the Likimro river February. The name Kisama is significant in more ways than one. The word ‘ Kisa ‘ in Angami dialect means ‘ New house ‘. The location of Kisama lies between two Angami villages, Kigwema and Phesama. After consultation with village elders, They decided to take one word from each village ‘ Ki ‘ and ‘ Sa ‘ and coined the name of the Naga Heritage Village as ‘ Kisama ‘. It is 12 kms away from Kohima.